Here's some Rugged looking Stuff! 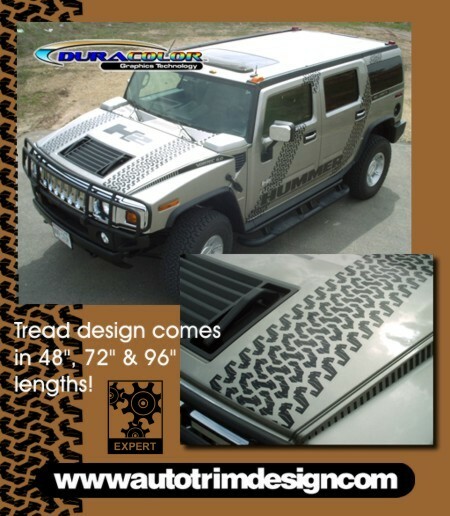 Detail your H1, H2, or H3 with this Tire Tread design taken from the actual tread of the Hummer H2's stock tire! The tread design is full scale in width (10.402" [26.42cm]) and comes in three (3) different lengths (48", 72" & 96"). Use these graphic panels in any creative design configuration you can think of. Digitally printed in Black or SIlver on Clear automotive grade vinyl materials with our DuraCOLOR graphic technology, these graphics will really set you apart from the rest!